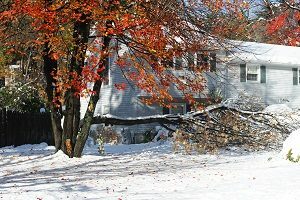 High winds, plummeting temperatures, snow, and ice: all of them together can cause massive damage to the plants surrounding homes, apartment, and businesses. And while this latest snowstorm might have been dubbed a “bomb cyclone,” much of this damage can occur after any Nor’easter or blizzard that New England gets in the winter months. After the storm has cleared and you can head outside, here are the first steps you or your groundskeepers can do to save your plants and trees while keeping your property safe. As we talked about in our What To Do After a Frost Hits Your Garden blog, the biggest danger is over-pruning. Plants that are damaged by high winds and debris can be trimmed, but leave the last couple of inches of the affected area alone. This is especially true if the plant is currently hibernating for the winter: pruning up to the living plant can cause it to try and grow, depleting its stores of energy needed to get it through winter healthy. Make sure the plants are watered and let them recover. If plants were blown down during the storm, especially top-heavy plants or flowers, inspect their stems for damage. If severe, you may lose the plant, but otherwise try to stake and tie-up the plant so it can recover. If the storm or subsequent shoveling unearthed roots, make sure to quickly fill the soil back in to insulate the roots from the cold. Trees are a much bigger project after a storm damages them. Assuming everyone is safe and the tree itself has not fallen over or broken on the trunk, you can take the following steps to improve its chances of recovering and living through the winter. Stay Safe Out There: When you go out to inspect, check for downed power lines, hanging limbs, or branches or other debris caught in the limbs of yours or nearby trees. Know When to Call in the Professions: If you see any of the above issues, the damage is high on the tree, or will require heavy machinery such as chainsaws, stop and call the professionals. Remove and Repair: Remove any broken branches from the tree. After that’s done, prune back breakages to the larger branch or to the trunk to reduce the chances of rot and help recovery. Deal with Torn Bark: If bark has been torn away, tidy up the edges to avoid places for insects or animals to burrow. Try to avoid damaging the inner green layer (the cambium) as much as possible. Resist Over-Pruning and Topping: Your tree could be asymmetrical or just unappealing after you’re done repairing the damage. Leave it alone. Also, don’t trim the top branches (topping) to avoid more storm damage. Both will affect the recovery time of the tree. At Greener Horizon, we’ve been providing landscape design and management throughout Massachusetts for years. We hope the above tips help you keep your landscape beautiful and your plants and trees healthy. If you need help managing your residential estate or commercial properties, we can help. Contact us today to get started.